Reacts with an internal epitope of BCRP/ABCG2. Store at +4°C short term (1-2 weeks). Aliquot and store at -20°C long term. Avoid repeated freeze / thaw cycles. Our Abpromise guarantee covers the use of ab24115 in the following tested applications. ICC 1/20 - 1/50. Acetone fixed cytospin. WB 1/20 - 1/50. Detects a band of approximately 75 kDa (predicted molecular weight: 72 kDa). (1/10 dilution on bone marrow and kidney tissue). Xenobiotic transporter that may play an important role in the exclusion of xenobiotics from the brain. May be involved in brain-to-blood efflux. Appears to play a major role in the multidrug resistance phenotype of several cancer cell lines. When overexpressed, the transfected cells become resistant to mitoxantrone, daunorubicin and doxorubicin, display diminished intracellular accumulation of daunorubicin, and manifest an ATP-dependent increase in the efflux of rhodamine 123. Glycosylation-deficient ABCG2 is normally expressed and functional. BCRP/ABCG2 contains a potential glycosylation site (SwissProt) which may explain its migration at a higher molecular weight than predicted. Overlay histogram showing HEK293 cells stained with ab24115 (red line). The cells were fixed with methanol (5 min) and then permeabilized with 0.1% PBS-Tween for 20 min. The cells were then incubated in 1x PBS / 10% normal goat serum / 0.3M glycine to block non-specific protein-protein interactions followed by the antibody (ab24115, 1µg/1x106 cells) for 30 min at 22°C. The secondary antibody used was DyLight® 488 goat anti-rat IgG (Fc) (ab96971) at 1/500 dilution for 30 min at 22°C. Isotype control antibody (black line) was rat IgG2a [aRTK2758] (ab18450, 2µg/1x106 cells) used under the same conditions. Acquisition of >5,000 events was performed. This antibody gave a significantly decreased signal in HEK293 cells fixed with 4% paraformaldehyde (10 min)/permeabilized in 0.1% PBS-Tween used under the same conditions. Immunocytochemistry/ Immunofluorescence - Anti-BCRP/ABCG2 antibody [BXP-53] (ab24115)Image courtesy of an anonymous Abreview. ab24115 staining BCRP/ABCG2 in murine mesenchymal stem cells by Immunocytochemistry/ Immunofluorescence. The cells were fixed in formaldehyde, permeabilised in 0.1% Triton X and then blocked using 1% serum for 1 hour at 25°C. Samples were then incubated with primary antibody at 1/25 for 15 hours at 25°C. The secondary antibody used was a donkey anti-rat IgG conjugated to an Alexa Fluor® used at a 1/100 dilution. Publishing research using ab24115? Please let us know so that we can cite the reference in this datasheet. Free of charge replacement being sent. Inquiry: I tested this antibody by immunofluorescence in dog mammary primary cells and I obtained a signal very weak and it seems not so specific. I used HEK293 as positive control and I obtained the same results that I obtained in dog cells Fixation: PFA 4% Blocking condition: BSA 5%-PBS 1X for 1hr at room temperature Primary condition: I tested 1/10 1/25 1/50 1/100 dilutions in BSA %%-PBS 1X for 3hr at room temperature. Secondary condition: goat anti-rat IgG (H+L) Alexa Fluor 488 at 1/800 dilution for 1hr at room temperature. Thank you for taking the time to contact us and provide the details. I am sorry to hear you have had difficulty obtaining satisfactory results from this antibody. I would like to reassure you that ab24115 is tested and covered by our 6 month guarantee for use in ICC-IF and human samples. In the event that a product is not functioning in the applications and species cited on the product data sheet, we will be pleased to provide a credit note or free of charge replacement. 1. 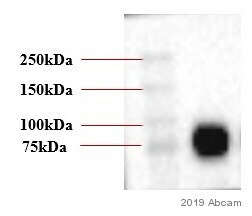 I am sorry to confirm this antibody is not tested in dog samples, it is tested and covered by the guarantee in human samples. 3. How has the antibody been stored? 4. I would appreciate if you are able to provide any images which would help me to assess the results. 5. I can recommend to try overnight incubation 4oC. This can often provide more specific and efficient staining. 6. Will the secondary antibody detect the rat IgG2a isotype? What is the supplier and product code? Has the current vial worked well with other rat IgG2a primary antibodies? 7. Looking at the Abreviews on the datasheet, other customers have used acetone fixation successfully (which wil also permeabilize the cells). Others have fixed in paraformaldehyde then permeabilized in Triton. I can recommend to try this. It may be that the epitope is on the intracellular side of the membrane and so permeabilization is required. Thanks for your e.mail .. I am asking .. can I used them immunofluorescence (IF) for paraffin embedding section ..
Do you have protocol start with .. I have to confirm that we did not test this antibody in IF with paraffin embedded sections. This is in theory possible. Although often high background occurs with this method. I am wondering whether those antibodies can b used in IF , paraffin section / in what concentration . I am happy to confirm that both antibodies are tested and guarantee for IHC-P. 1.) We used ab52816 successfully in a dilution of 1/100 in IHC-P with human squamous cervical carcinoma by Immunohistochemistry, Paraffin embedded tissue. Please not that these dilution factors are only recommended starting points for your own optimization experiments. I wish you good luck with your experiments. I am sorry this product did not perform as stated on the datasheet and for the inconvenience this has caused. As requested, I have issued a free of charge replacement for one vial of ab24115. I did try the FITC conjugation kit and did not get any fruitful results. I repeated the conjugation experiment as mentioned in the product sheet but no luck. Thank you for your reply. As we had previously discussed, ab24115 is not in an ideal formulation for use with our conjugation kits due to the fact that is not a purified antibody and it contains BSA as a stabilizer protein. I am sorry that these products were unable to produce good results in your experiment, and if you want I would be happy to either refund your kit purchase, or send you an alternative antibody to try as a free of charge replacement. Please let me know how you would like to proceed and I will be happy to assist you further. Thank you for getting back to me. This customer is very appreciated for your help. Regarding the EMSA result, she would like further to know whether the result was good or bad. Would you please help provide some comment or other information? Because there are many unique requirements for each nucleic acid binding protein and the corresponding antibody, there is no universal set of reaction conditions. If no information on prior work is available, conditions should be determined empirically.In general, the supershift assay is a step which can be optimised in various ways. So could the incubation time and temperature be altered and may range from for example 1 hour to overnight at 4C or 15-45 min at room temperature. Or the antibody could be addedin different concentrations before or after the oligos. Also, factors that affect the strength and specificity of the protein:DNA interactions include the ionic strength and pH of the binding buffer, the presence of nonionic detergents, glycerol or carrier proteins (e.g., BSA),the concentration and type of competitor DNA present. If the customer has tried various conditions (which I am sure with her experience she has) and provided the ABCG2 protein construct is capable of binding to DNA, it might well be that the antibody is not suitable for EMSA. Antibodies being used to create a supershift may not work in a binding buffer that is optimal for a protein:DNA shift complex.Many nuclear proteins function well for shift complexes under reducing conditions. Therefore concentrations of DTT at 1 mM and higher are often added to the EMSA binding buffer. Yet, many antibodies become reduced and loose functionality in reducing conditions. Also, the epitope may not be in an appropriate location which preventsbinding of the antibody when the protein is bound to DNA. Therefore,the outcomeof theexperiments seems unfortunately negative, however, it is very good toknowunder which conditions the antibodydoes not work! Thank you very much for your time and contribution! I am sorry that I cannot be of more assistance on this occasion to help improve the results. Do you offer a cold epitope for ab24115 BXP-53 Rat monoclonal antibody to BCRP/ABCG2? I am looking to use a cold epitope for blocking prior to primary antibody incubation during for immunoblotting. Thank you for your interest in this matter. Thank you for contacting Abcam. Unfortunately we do not have a blocking peptide available for this product. The sequence that was used to generate this antibody was ******** of Mouse BCRP/ABCG2 (SwissProt: Q7TMS5). You could have a peptide synthesized against this sequence and use that peptide for your blocking experiment. If there is anything else I can help you with, please let me know.